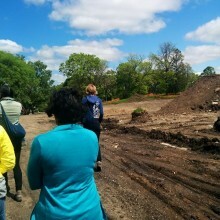 The dancers of Ananya Dance Theatre visited Frogtown Farm, near Minnehaha and Lexington avenues in St. Paul, May 30, as part of their research for the creation of Roktim: Nurture Incarnadine. The full-length work of dance theater will premiere at The O’Shaughnessy, Sept. 18-19. Inspired by the Seed Sovereignty Movement and farming practices in local communities of color, choreographer Ananya Chatterjea, Jones, and behavioral artist Marcus Young are partnering with Frogtown Farm, Afro Eco, and the Indigenous Peoples’ Task Force to produce a story reflecting and honoring the age-old work of women who cultivate, nurture, and protect land and agriculture with emotional and blood labor to create a just and sustainable food system for our shared future. Frogtown Farm will be a hub for a healthy food system that fills gaps in food production, storage, manufacturing, and distribution. With spokes that reach beyond its acreage and the Frogtown neighborhood, Frogtown Farm will be recognized as a destination for those seeking learning, innovation, reflection, celebration, and authentic community. 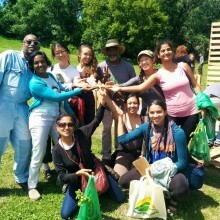 Rooted in values of social equity, justice, and inter-connectedness, this urban farm on the hill will serve as a model for multi-cultural community and a catalyst for economic development, wealth creation, community pride, and sustainability. Frogtown Farm is the vision of longtime Frogtown residents. For the past year, Frogtown Farm has worked in concert with members of the community, The Trust for Public Land, the City of St. Paul, and the Wilder Foundation to acquire a 12.7 acre parcel of land for a public park and farm, of which 4.4 acres will be developed as an urban farm.